The last 3 times I’ve had company over for dinner, I’ve made this easy Mexican casserole. Every time I’ve made it, my guests have requested I share this recipe with them. Is there any better compliment to a cook? The inspiration for this recipe came from none other than Pinterest. I was searching for a Mexican casserole. Every recipe that came up called for either rice or beans – neither of which I had on hand. After reading through several of the recipes, I decided to punt with the ingredients I had on hand. The result is a mighty tasty casserole that pleases the biggest of appetites. 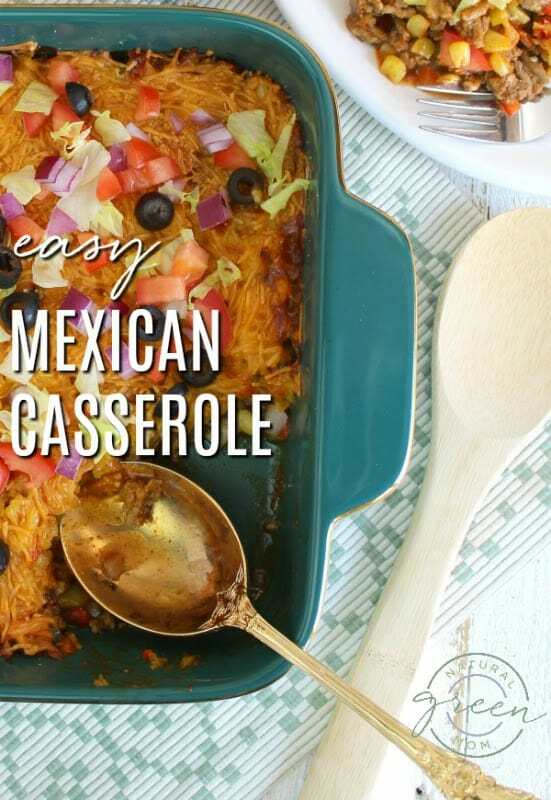 This Mexican casserole recipe is heavy on the vegetables. But in the best way. The vegetables help fill you up without adding a ton of calories. Before you start making this recipe, I want to give you a heads up. One of the ingredient steps calls for frozen corn, slightly thawed. Place frozen corn in a strainer and run cold water over it. Easy peasy. By the way, while homemade enchilada sauce is actually pretty easy to make, sometimes you just need the ease of a ready made sauce. I always reach for this organic brand enchilada sauce. In fact, I keep several of these on hand for nights I just can’t even. When picking a pre-made enchilada sauce, keep in mind tomatoes always make the EWG list of the dirtiest vegetables. Be sure to pick a clean eating, low sugar brand of enchilada sauce. 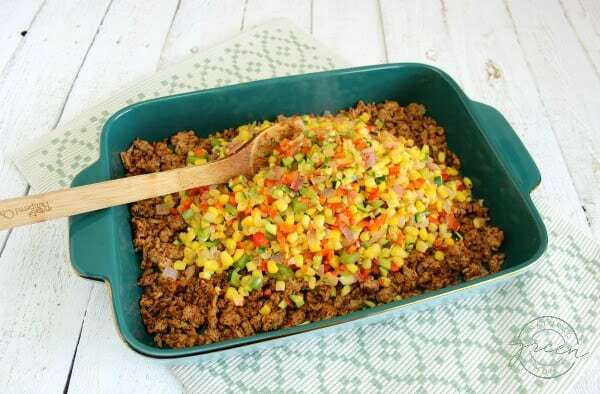 Just an FYI: this easy Mexican casserole recipe calls for ground turkey, but ground beef could easily be substituted. Preheat oven to 350. Prepare a 9x13 casserole dish. 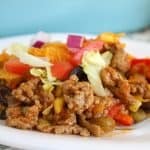 In a large skillet, brown ground turkey. Once turkey is cooked through, add chili powder and cumin and cook an additional minute. Layer cooked turkey in the bottom of the 9x13 casserole dish. To same skillet, add red pepper, green pepper, onion, and zucchini. Saute until vegetables are soft. Add garlic and corn to the other vegetables in the skillet. Continue cooking until corn is heated through. Layer vegetables on top of the browned turkey. Pour enchilada sauce evenly over the entire casserole. Top with shredded cheese. Bake casserole at 350 for 25-30 minutes or until hot. Serve. 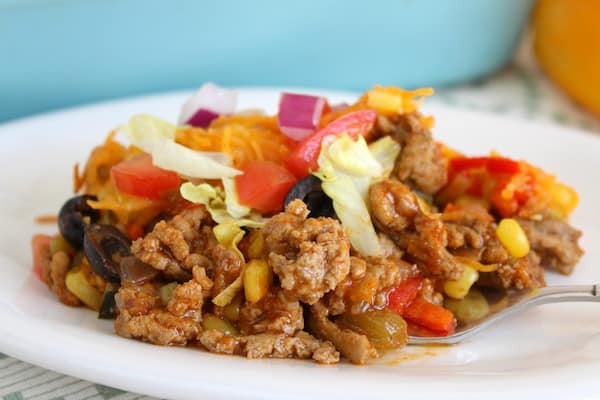 I like to serve this easy Mexican casserole with a side of cornbread and a simple lettuce and tomato salad dressed with the creamy cilantro dressing from my homemade meatless taco salad recipe. So super yum! However, since the recipe doesn’t call for rice or beans, you could serve Mexican rice and refried beans on the side. If I did that, I would probably mix everything together on my plate cuz wow would that be good! If you serve this to your family, I’d love to know how they liked it!